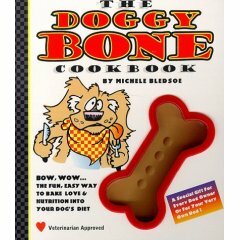 Professional kitchen tested hundreds of Doggy Bones on the most discerning canines to determine the top favorite recipes. Even the pickiest biscuit connoisseur will give homemade Doggy Bones a five-paw rating! Bark-B-Q, Howl About a Mint, Yappy Birthday, Peamutt Butter, and Howl Wheat are a few of the easy-to-make recipes your dog is begging for! A 4-inch dog bone-shaped cookie cutter is included with every book. Veterinarian approved recipes. Color illustrations fill every page. Your dog will give you the paws up!